The Odd Couple: ASAP Rocky And Tyler, The Creator Take New York : The Record Once at opposite ends of the hip-hop spectrum, two young rappers join forces for an unlikely tour. 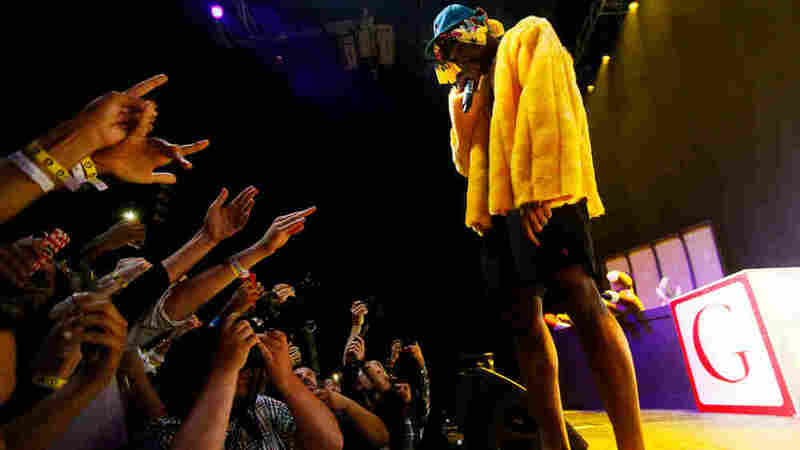 A$AP Rocky performs for a sold-out crowd at the Theater at Madison Square Garden in New York City. Years ago, who would've predicted that Tyler, the Creator and A$AP Rocky—two Internet-borne yet ostensibly opposite rap stars—would be touring together? A little background: In 2011, they were the future, representing youth movements as progressive as they were nostalgic. Tyler made waves for reinvigorating the transgressive shock-rap of MCs like Eminem, yet also drew strongly from Pharrell's harmonically sophisticated productions with the Neptunes. Rocky fused styles in a way that seemed to make the regionalism that had segmented rap for decades seem irrelevant, yet did so by drawing distinctly from predecessors in his home of Harlem (like Cam'ron) and his spiritual home of Houston (like the Screwed Up Click). Both artists fronted big crews—Rocky's A$AP Mob and Tyler's Odd Future—which were more like syndicates, of capable (if not superior) rappers, harkening back to a somewhat bygone era of rap posses such as Dipset and Wu-Tang. And both were stylistically distinct and youthful compared to everyone else. Yet despite the similarities, their futures were distinctly different and seemed unlikely to overlap. Tyler's audience worshipped him as an alternative to the normative conventions of mainstream rap; Rocky's loved him for his ability to make those old things seem new again. 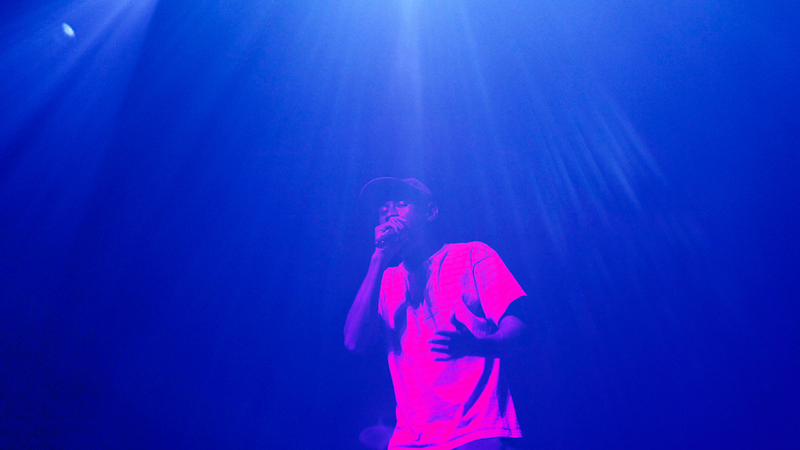 Tyler, the Creator took fans through a range of emotions during his set. In 2015, things are different. A$AP Mob and Odd Future, while still two of the Internet's greatest fascinations, aren't subject to the same scrutiny that caused all those misundertandings. And both have evolved as units: Odd Future broke up, and A$AP Mob lost its behind-the-scenes operator, A$AP Yams, to a drug overdose. Tyler and Rocky's most recent albums, Cherry Bomb and At Long Last A$AP, reflected chastened worldviews, less reactive to the volatile environment of Internet news. All this may explain why the pair had come together for an as-of-now 13-date tour. 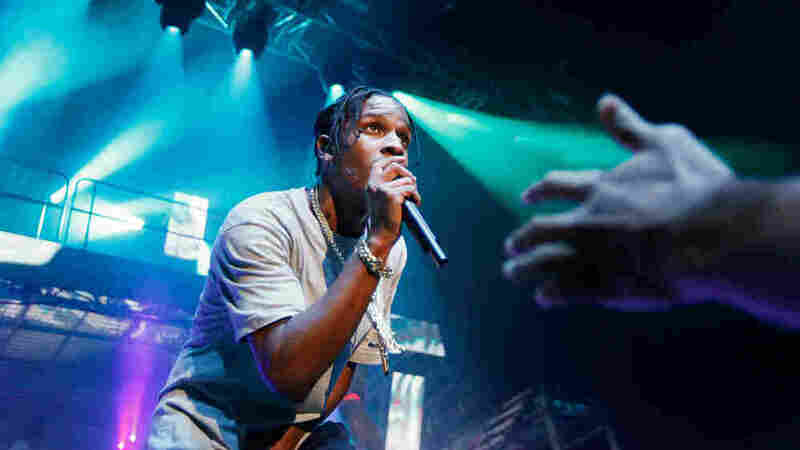 Ask Rocky, and he might tell you – as he announced onstage at the Theater at Madison Square Garden on Tuesday, Sept. 22 – that this slate represents an alternative to mainstream rap, a tour designed to reflect rap "the way we see it." But what is mainstream rap in 2015? The genre's most successful and acclaimed artists – Drake, Kendrick Lamar, Young Thug, Rocky and Tyler themselves, to name a few – are also vanguards of new and progressive ideas about how it should sound. Ask Tyler, and you get a more straightforward response. "When they first told me about this, I was like, 'Nah, that's weird,'" he explained, introducing their tour announcement video. "Time went on," he continued, and Tyler changed his mind. "Why not?" That question framed Tuesday's show, the tour's second date. For the trip, Tyler brought Odd Future affiliate Vince Staples, whose Summertime '06 has been celebrated as one of the year's most powerful and important albums; while Rocky brought his friend Danny Brown, a rapper as known for his elastic flow and club beats as for his chipped-tooth smile and asymmetrical shock of hair. Any of these four is a hot ticket on their own. Tyler, the Creator joins former rival A$AP Rocky as well as Danny Brown and Vince Staples on tour. With talent and buzz in abundance, the concert had the distinct feeling of "Class of 2011: Where Are They Now?" Staples and Brown gave spirited, albeit brief performances to open the show, stalking around replicas of the playhouse from Tyler's "IFHY" video. Brown, despite appearing a little exhausted, bopped around the stage lankily, flailing and squawking like an Animaniac. Tyler's set was met by explosive excitement from the crowd, most prominently the teenage skater-kid OF devotees who dominated the mosh pit near the Theater's stage. They're easy to pick out: Like Tyler, they dance hard and dress brightly, or as Earl Sweatshirt, Tyler's erstwhile and most talented OF companion described pejoratively, like an "Easter basket." Tyler's set spanned new music and old, inhabiting the character of his songs and the mania of his audience at sharp inflections. He brought fire and malice to his most lurid and shocking raps, and melancholy to his numerous anthems of misunderstanding. Live, it is so much easier to hear the beauty of his arrangements, an interest that grew from a love of Roy Ayers to infuse much of his music, and shone most clearly live with Cherry Bomb's single "F*cking Young." Still, it was hard not to feel like Tyler's music was too easily misunderstood in the context of these other rappers. Wondering if "my father would ever like me" requires an emotional finesse that's hard to make in a venue that big, and certainly amongst an audience as eager to party as this one. So transitioning to Rocky's swaggy assault cast Tyler's set in a somewhat unflattering light. Even more so because A$AP bears the torch for New York City's proud tradition of winning squads, and pit Tyler up against Rocky's home court advantage. A$AP Rocky closes the show with a raucous set. 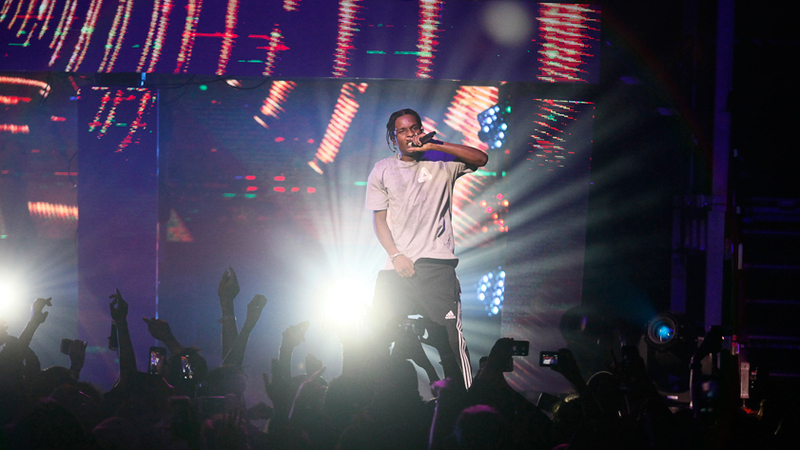 Rocky's show involved a complex laser light show, a two-story building-like stage, smoke machines, and a five-man corps of hype men who jumped and ad-libbed and repeated his lines. The pyrotechnics may have all been unnecessary, however, because the audience became riotous at the first beat. New York pledged allegiance again and again with unprompted chants of "A$AP! A$AP!" that continually interrupted the show. Rocky responded with his hits: "Goldie", "M's", a show-closing "Wild for the Night" – as well as material from At Long Last A$AP. He ended the show exactly at 11:30, having lost track of time, but not before thanking the crowd and his collaborators: Vince Staples, for being a real artist, Danny Brown, for holding it down for all those years, and Tyler, for being "weird" and "inspiring." The differences between the two cast them into sharp relief when this clearly juxtaposed; but who's to say that this contrast hasn't now become the source of some real inspiration? "Why not?" Tyler asked in their tour video. "And now look at us."